Not yet at my end here in India. But it's a good update. Good to keep it in view. No, facebook is not the good example to follow (and that people can be convinced does not mean it is a good thing either !). And now that I think about it, I remember how annoying I found it to have to look for and multi-click to logoff from facebook. loging off is also a security feature. Cannot be hidden nor to far away. Facebook buries the sign out link because they don't want people to sign out. I know Google would prefer they not sign out, but THOUGHT you understood that it was best in the interest of security. Won't it make more people accidentally click the 'sign out' link when all they wanted was look at their profile/settings?? Its better to take this link out of the way of normal operation inside a menu than get people signed off unintentionally. I don't have the separate Sign Out link yet but I sure would like to see it! (I've been playing with alternate accounts lately and been flipping back and forth). It pisses me off that Facebook has theirs buried so deep. The fact I rarely visit Facebook (Tweetdeck has all the Facebook I want) makes it even more frustrating in that I spend as much looking for the logout link as I did for originally logging in the 1st place! I know that usually making too many things an "option" just complicates matters and makes a preferences page unwieldy, but I think this is something that should be an option. For many, I can understand wanting the sign out link to be in your face. For me, however, I'd prefer it be an extra click away. I use multiple sign-in and am constantly switching between accounts. Now, I'm concerned I might accidentally sign out when I only meant to switch accounts. When you sign out from multiple sign-in, you sign out of all accounts. So, I would have to sign in multiple times again just to get back to the state I prefer to be in. Maybe, instead of an option, Google could monitor usage and adapt accordingly on a user-by-user basis? i.e., someone who clicks "sign out" a lot (when it's buried) could have the sign out link brought to the surface, whereas someone who switches accounts a lot could have the "switch account" link brought to the forefront. Just a thought. I am betting this is just a experiment by google. I will bet if to many people are signing out for google liking, it will be quickly dropped. Thank you Google. I never appreciated the ease of 1 click over 2 clicks until they buried the Sign Out link inside the menu. Log out is much better like this. I don't mind Sign out being under the user name menu. I think adding Sign out on its on button will clutter the clean look of the new menu, but I can see why some users will welcome this change. Just reporting in: 2 out of 3 public computers in vacation locations Ive visited had facebook already logged since the had failed to click logout or even close the browser. It should be possible to detect if a computer is a typical "public access" machine and then auto-enable a checkbox on the login screen to activate a kind of autologout-system. When people re-login and uncheck the checkbox you know you made the autologout too harsh (for that user). Banks and gov't sites like 15min timeout with a popup "Continue or log out now?" when time is nearly up, but personalization of how many minutes someone likes could even work automatically. Not seeing it yet, but we've been pleading for it since Google decided to go "minimalist" and hide all the important/useful stuff under non-intuitive menus. Hope this is a permanent back-down — it doesn't make sense to hide a security feature! 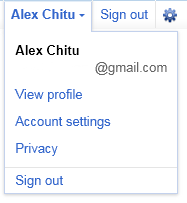 I enjoy all the updates Google has, but this "log-out" being hidden in a menu is frustrating. when it came out, I defiantly was trying to look all over for it. Thanks for a email telling us about this or notifying us!! This can be difficult for those who move the mouse away from the menu then have to re-try to click the right link. Firefox has does similar to its new browser look.. 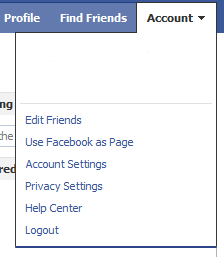 I HATE this change in Facebook, and you should not follow Facebook's example.Google has to be better!! There should be option for people to choose what settings they want, but as a user mentioned above a "time-out" pop-up should be implemented for security reasons.